ST. GEORGE – Police arrested a 30-year-old woman for aggravated robbery Saturday after she pulled a knife and threatened a Christensen’s Department Store employee who tried to stop her for shoplifting at the store, located at 761 S. Bluff Street in St. George. At approximately 3:35 p.m., a police officer was traveling north on Main Street near 900 South in St. George when a man waved him down and pointed to a woman who was running south on Main Street, according to a probable cause statement written by St. George Police Officer Scott Cleveland in support of the arrest. Police stopped the woman who was identified as Heather Janelle Apple, of St. George. When questioned by police, Apple allegedly admitted to having stolen property from the department store, according to the statement. “She said she pulled out the knife and showed it to the victim to get him to stop following her,” Cleveland said. During a search of Apple’s person during her arrest, officers located $346.16 worth of stolen property from Christensen’s, along with heroin, methamphetamine and drug paraphernalia, the statement said. Officers additionally located an open black serrated folding knife and pepper spray inside of her purse. Apple was arrested and booked into the Washington County Purgatory Correctional Facility. 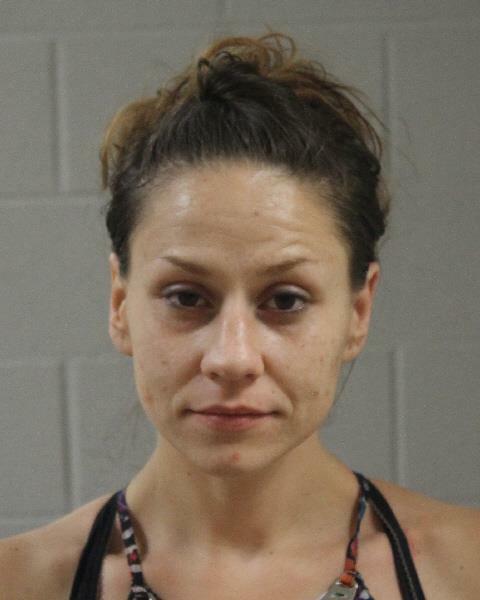 She was charged with a first-degree felony for aggravated robbery, two second-degree felonies for heroin and methamphetamine possession, a class A misdemeanor for unlawful possession of a dangerous weapon, and two class B misdemeanors for retail theft and possession of drug paraphernalia. Bail for her release pending trial was set at $33,310. Apple is scheduled to make her initial court appearance on May 4. One less Miss St George contestant, pitty.